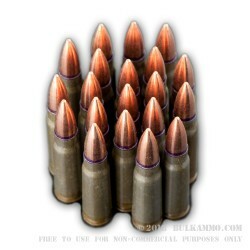 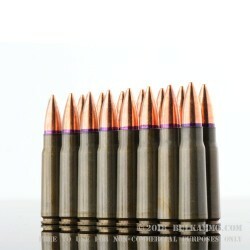 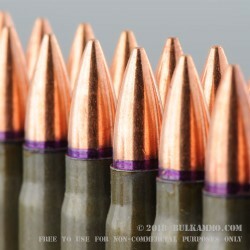 A very nice 7.62x39 load for the money, and with an exceptional amount of reliability and no legitimate complaints about the build quality or feeding of the round which is a 124 grain boat tail full metal jacket projectile in a steel case with a Berdan primer and a military specification lacquer seal on the throat of the cartridge. 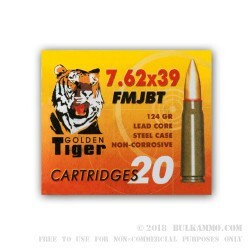 Note: this ammunition is exceptionally high quality but does tend to be best used in AK/Clones and SKS’s as opposed to the AR platform, where firing pin strikes can be too light to observe 100% reliability. 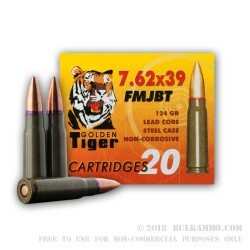 It’s important to understand that the primer is significantly harder on these cartridges than some other offerings for the caliber, and while it’s not a guarantee that your AR won’t shoot it, it has occasionally happened that an AR won’t achieve 100% ignition with these cartridges. 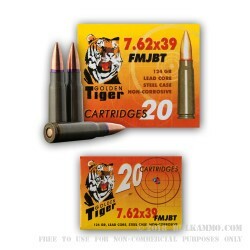 This round is highly reliable and has a track record of unmatched quality when it comes to cheap shooting ammunition for your AK and SKS firearms. 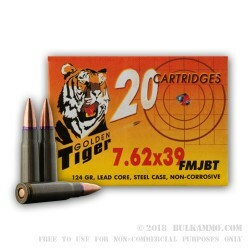 The performance is great across the board whether it is used for hunting, target practice or reactive targets or plinking.